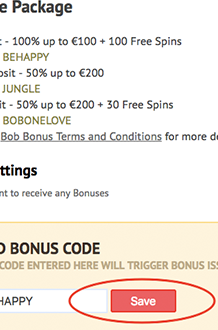 Bob welcomes every new player with suitable bonuses, especially after your first deposit! This will not only get you a 100% bonus on slots up to $100/€100, but 100 free spins for the Boomanji slot along for the ride! Need a hand getting the bonus? Come on down and find out how to receive it. This bonus is the perfect way to get you started on your way to become the MVP on Bob Casino. ✓100 free spins are given throughout 4 days by 25 spins each day. 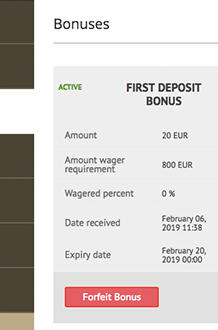 Please note that this bonus is not available for the players from Hungary, Serbia and Croatia. 1. Go to your account and click the green Deposit button on top or in the Balance section. 2. 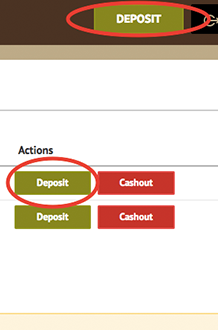 Before the deposit, make sure to click the I have a Bonus Code, enter the code “BEHAPPY” into the field and Save it. 3. 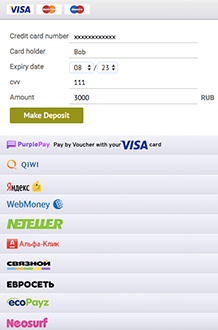 Scroll down, choose your preferred payment method, fill in the information and click Make a Deposit. 4. Once the deposit is complete, go to the Bonuses section and activate the bonus! Now, the first batch of free spins will be available in 23 hours after you've wagered the deposit. As soon as the bonus is activated and you are given the first batch of 25 free spins, you will need to complete just x1 wagering requirements to use it. After receiving them, you need to activate them in your user account. As mentioned, 25 free spins will be added in 23 hours upon activating the bonus and additional 25 free spins will be added every 24 hours for 4 days.